This week at The Perfect Sentiment we are challenging you to honor the special men in your life with a card. You can use whatever sentiment you feel appropriate for your masculine card as long as you remember to include it on the front of your card. Our twist this week is "no patterned paper". Our sponsor this week is Pattie's Creations. 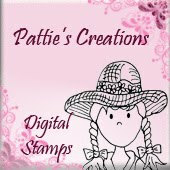 Pattie will award one random winner a digital stamp of their choice. Since I couldn't use any patterned paper I chose to work with one of the older dynamic duos from Stampin' Up!®...Retired Brilliant Blue and current Bashful Blue. I chose to create an embossed pattern on the Bashful Blue cardstock using a Sizzix Textured Impressions Embossing Folder. I cut out a lacy oval with a Spellbinders die and stamped the lighthouse image from Sweet n Sassy Stamps on it in Danube Blue from Memento Ink. I then inked all the edges of the lacy oval with the same color of ink. When I think of masculine cards I always think of buttons so, I added three buttons to the bottom of the panel for a clean and simple finished look. Once inspired, please come join us at The Perfect Sentiment. hun, i love this card so much! fabulous image and the embossed background is wonderful...the buttons make it very special...GREAT job! 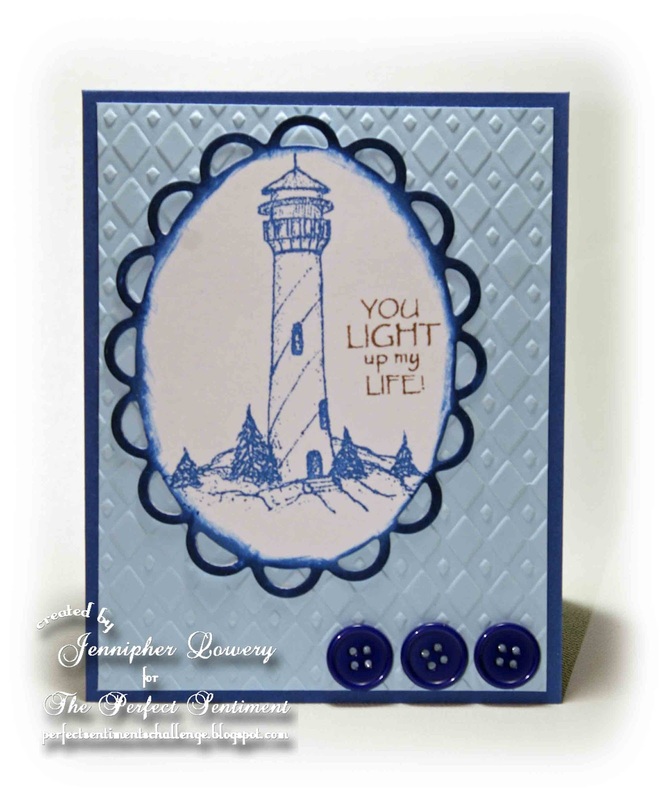 This is a wonderful card for anyone, love the way the image is not colored so you really see that beautiful lighthouse and the embossing. great card jennipher love the embossing folder. What a great idea to replace the paper with embossing! Fantastic card!! Great card, love the embossing! A lighthouse is always a great masculine image! Thanks for joining us at Paper and Such for our challenges this week! Jennipher, this is so pretty! I absolutely LOVE all that blue and what a fantastic image too. Perfect embossing and the buttons just top it off. Hey Jennipher, nice to see you at DCD again! Great card without even using patterned paper--now that is a challenge!--Pat N.
Oh brilliant blue.......how I miss thee!!!! :-D love your card! TFS! What a great card. LOVE that lighthouse stamp. The blues are just beautiful. Great job. What a great masculine card! Reminds of my island home! Love it! Thanks for playing along with the Die Cuttin' Divas this week. 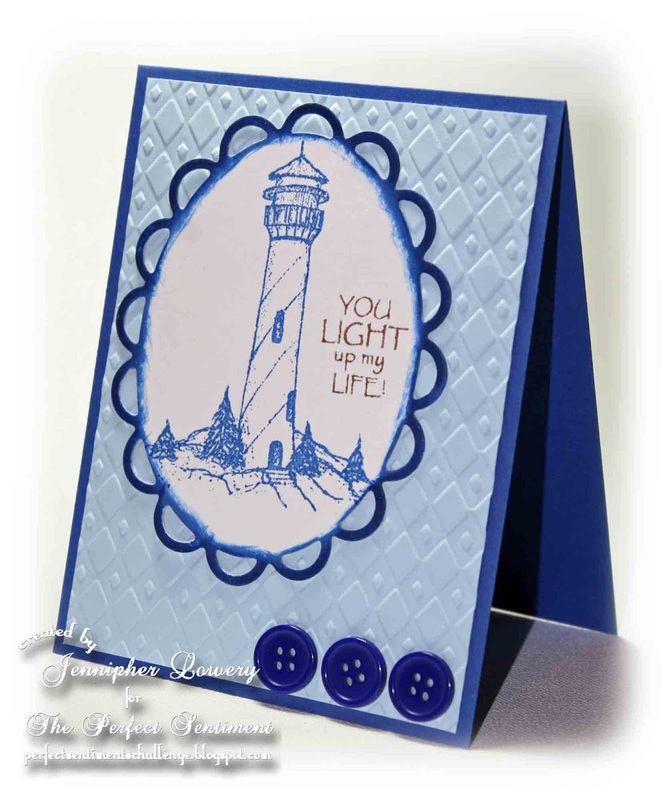 Great guy card, I've always loved lighthouses. Thanks for joining the Dig Out The Old Challenge at Top Tip Tuesday. I love your monochromatic blue color scheme with that great lighthouse image! The buttons are a great accent, but that embossed background really caught my eye too :) Nicely done! Excellent choice of color and image for this one Jenn! I love the lighthouse and the buttons really pop on this! I love that embossing folder you used. Perfect image for this and the added buttons add that special touch. Wonderful colours, image and embossing for a masculine card! Love the addition of the buttons, too.